• The Latino population is expected to double in the next 20 years. • Latinos are predicted to be a majority of Arizona’s population by 2035. • More than 65,000 Latinos in the United States turn 18 every month. • The share of votes cast by Latinos is forecast to rise from 9 percent in 2006 to 14 percent in 2014. PHOENIX – Latino voters in Arizona are steadily increasing their impact on elections, according to a report released Thursday by the voter-registration group One Arizona. According to State of Arizona’s Latino Voters: Election 2014 Report, the number of registered Latino voters who have signed up for early voting list has tripled since 2010. The share of votes cast by Latino voters rose from 9 percent in 2006 to 12 percent in 2010. One Arizona estimates that that number will go above 14 percent this year. Figures from U.S. Census Bureau and the Pew Hispanic Research suggest that with more than 65,000 Latinos in the United States turning 18 every month Arizona’s Latino population is expected to double in the next 20 years and to become a majority by 2035. Heredia said the larger share of Latino votes will mean more of a political voice. 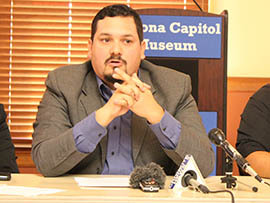 Eric Christopher Hedberg, senior research scientist with Arizona State University’s National Opinion Research Center, said the increasing share the vote cast by Arizona’s Latinos reflects the aging of that population. Bill Hart, policy analyst with ASU’s Morrison Institute for Public Policy, said Latinos will dominate Arizona’s politics in a few decades if their level of participation keeps increasing. That will influence issues such as immigration, health care, employment and, most significantly, education, since many schoolchildren will be Latino, he said. “As Latinos achieve greater and greater levels of political power, they will use some of that influence to try to improve the state’s public education system,” Hart said. More than 300,000 Latino voters in Arizona received an early ballot this election, leading the organization One Arizona to predict an increase in Latino votes this year. Reporter Analise Ortiz found out how this could impact election results. 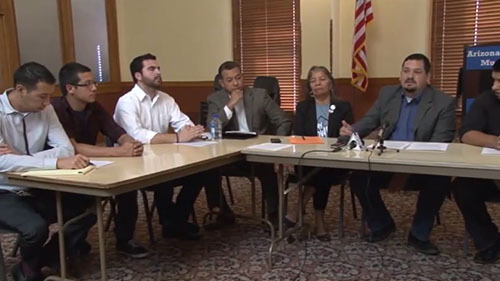 Francisco Heredia, executive director of the voter-registration group One Arizona, discusses a report suggesting that Latino voting power in Arizona continues to grow.